The first recorded astronomical activity in Malvern occurred towards the end of the eleventh century when Walcher, the Abbey Prior, used an astrolabe to accurately determine the time of the eclipse of 1092, from which he derived a set of lunar tables. Dr Hey, whose wartime work had earned him the title “Father of Radio Astronomy”, moved to Malvern in 1952 and wanted to continue in this tradition and restart his work in Radio Astronomy. 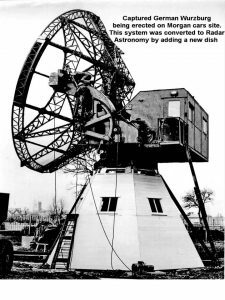 Dr Hey’s based his first purpose built radio telescope on a modified German Giant Wurtzberg radar which had been brought to Malvern after the war. 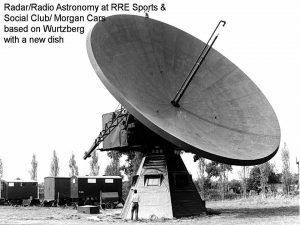 A parabolic reflector 15 m in diameter was fitted to the Wurtzberg radar which had been erected on the site requisitioned from Morgan cars and next to the RRE Staff Club. The dish, made of perforated aluminium sheet, was designed to have a high surface accuracy allowing operation at wavelengths down to 10 cm. It was the largest radio telescope operating at 3 GHz in the UK at the time. 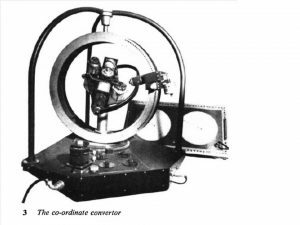 In order to be able to continuously follow a radio star so as to allow integration of the signal over a long period in order to improve sensitivity, a method of converting celestial co-ordinates (right ascension and declination) into the dishes horizontal and vertical axes (azimuth and elevation) is required. This was solved by building an analogue co-ordinate converter. 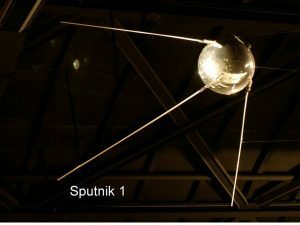 When fitted with a radar transmitter, with a peak power of 2MW and a pulse length of 5 microsecond, the telescope made accurate observations of the first Russian Sputnik satellite in 1957. At the time consideration was been given to using earth satellites composed of inflatable aluminium 100ft spheres for long distance radio communications. 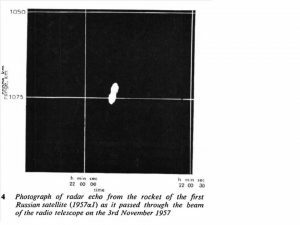 There were a number of practical difficulties with this approach but at the time technology was not sufficiently advanced to be able to consider satellites with integral powered transmitter/receivers. The moon was also investigated as a possible reflector for use in communications and the telescope was used to make radar observations of the Moon using the high power transmitter. The pulses bounced of the moon from Malvern were received by the University of Texas providing information on the lunar surface and its reflectivity. 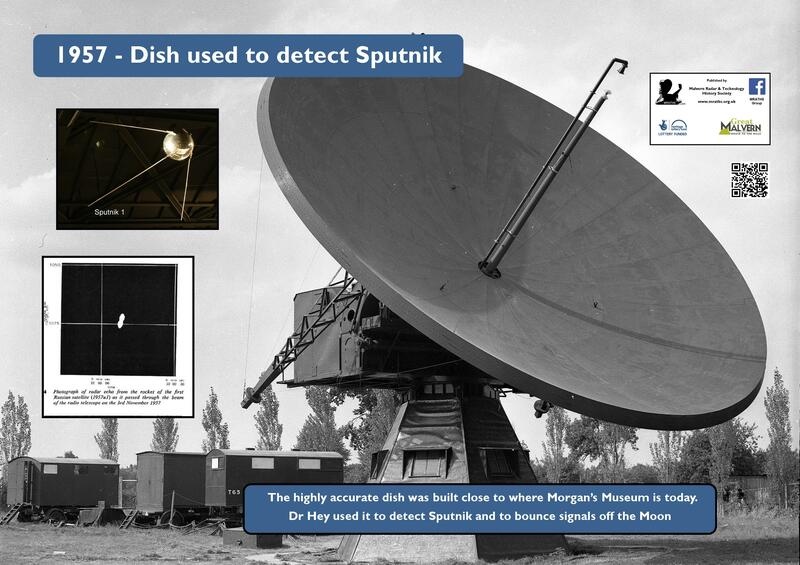 It was also used to study spectral lines and that lead to the refuting of a Russian claim to have detected spectral line emission from atomic deuterium.